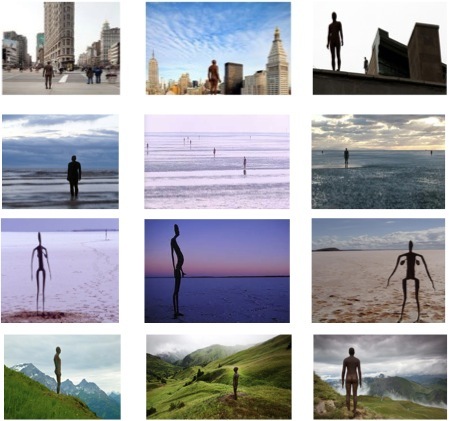 Sakshi or being a witness is an important concept in Advaita; however before we try to understand its meaning laid out in the Vedic texts, lets first take a look at four sculpture installations by Anthony Gormley in different parts of the world. Three of them are a part of a series acknowledged as such by the artist, the fourth one included by me since I see a similarity in the theme. Inside Australia is an installation of 51, life size figures stand spread out over a 7 square kilometer on Lake Ballard Western Australia. Lake Ballard being one of Australia’s fantastic salt lake systems. Body scans of the locals were taken and transformed into a series of abstract black steel figures. At sunrise and sunset the shadows, cast from the figures limbs, are contrasted against the brilliant white sand of the salt lake. Another Place is an installation on Crosby Beach that consists of 100 cast-iron figures, molded from the artist’s own body. The ghostly life-size figures are dotted along three kilometers of the Crosby shore, sparse in some areas and more congregated as they reach the sea front, so onlookers can catch the detail of those near and the shadow of sculptures in the distance out to sea in one eyeful. All the figures face in the same direction and in the same pose. The tide level determines the visibility of the figures; at low tide all of the figures are visible. As the water level rises, you can see the figures from waist high and at high tide one cannot see the figures. “ a kind of acupuncture of the landscape, but also acupuncture of people’s dream world ”. Event Horizon is a temporary installation of 31 life-size figures cast from the artist’s own body on pathways and sidewalks of Madison Square Park, as well as the rooftops of many land mark buildings in Manhattan including the Empire State building. “You could almost say the insertion of the sculpture is like the insertion of acupuncture needles within a collective body. And seeing how the body as a whole reacts to the presence of this irritation is very much the point.” ”It has to do with questioning both the status of art and the nature of our built environment. In a time of rising environmental awareness it asks the question: ‘where does the human being fit into the scheme of things? Horizon Field is an installation of 100 life size figures spanning 150 sq km across the idyllic glacier-topped peaks and rolling green hills of Vorarlberg, Austria‘s westernmost province. It involves the figures standing in a horizontal line 2,039m above sea level at intervals ranging from 60 meters to several kilometers, depending on the topography. While being a “Witness” finds mention at several places in many Upanishads, I particularly like its reference in Lakshmidhara’s Advaita Makarandah (Verse 13) in the context of the above Gormley’s images. “ I am” is the gateway to Atman. A person says I am a child; I am a young man; I am a middle-aged man; I am an old man. The change less is “I am” and everything else is the changing. Lets take a look at these images once again. Even though the artist made a comment that the sculptures in “Event Horizon” were celebrating the spirit of New York, I did not see any celebration or joy. Coming two years after the financial meltdown, I saw these figures witnessing the aftermath of excessive desire and greed that has lead to a global financial crisis. Standing over the financial ruins, observing myriad of human emotions and thoughts, these figures appear to contemplate on the effects of desire driven action. Standing in the epicenter of relentless pursuit of wealth and sensory experiences now witnessing the impermanence and the changing nature of both the object (wealth) and mind (thoughts & desires). Realizing that “I am’ remains, whereas wealth and experiences do not. On the other hand, the three installations on a lake bed, beach and the mountains, appear to contemplate on the “ I am”. In contrast to the urban situation of New York (Grihastha) they are now away from worldly thoughts and desires contemplating amongst the elements. Living a life of Vanaprastha or perhaps even Sannyasa. What are they witnessing now? The beauty of creation? And what else? After soaking the beauty of the landscape, what is left to witness further? Day becomes night, tide rises and recedes, seasons change. Meanwhile the figures remain where they are, as they are. ” I am “ remaining as it were, change less amidst a changing landscape. Adhyasa is finally removed, for what is thought to be change less and real (world) is also realized as changing and unreal and what is thought to be temporary and transient (self) is realized to be change less and real. Atman is realized. With due apologies to Descartes, “I witness, therefore I am”. Good article! Some years ago I wrote a critique in Amazon of a book (‘dismantling the fantasy’) one of whose statements being that “there is no matter, energy, consciousness, spirit, oneness, or mystery”, yet he was constantly referring to the ‘mystery of life’. Life is a “flow”, that’s all (again, no observer, etc.). Purely Heraclitean (no Parmenides). Only movement exists. The author did not pose to realise that “My being the witness of all that changes is proof enough to declare that I am the change less, because all the changes happen against the changeless background”, as this article notes. The book received accolades of approval. Thank you.